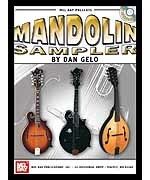 This collection of vibrant traditional and original tunes captures the variety of mandolin styles in America. The styles represented include old time country and bluegrass, ragtime, swing, Irish, Italian, and neoclassical. Some of the techniques explored are cross-picking, droning, voice-leading, double stops, and pull-offs. Of special interest are tunes that make use of the chord solo potential of the mandolin. A discussion of each tune provides lively commentary on the history and players behind the style, an outline of the arranging and composing ideas that are employed, and tips for practicing and honing technique. Tunes are shown in notation and tablature, and a CD is included. This is the perfect anthology for intermediate and advanced players who want to build their skills while expanding their range of styles.